Tofino Skateboarding: Tofino Skate park! The illusive Tofino Skate Park.Is it real? Is it really going to be built? The answer is yes to both of those questions! This is the first Tofino Skate Park Update, a monthly column we will be writing to keep everybody informed and up to date on the status of the park, upcoming events and who to contact for more information or to get involved. This is a very exciting time for everyone involved with the skatepark. We have been working very hard in the past few years on fundraising and gaining public support for this incredible community project. Now all that hard work is really paying off. In the last year momentum has been steadily growing as more people got involved and as word got out that this park will be a reality. 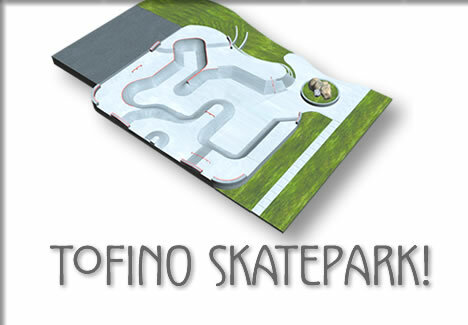 On April 28, 2003 the Tofino Skatepark Committee made a presentation to council to introduce itself to the new councillors that had not met its members and to request further funding for the upcoming year. We are always encouraged by the support we get at these presentations and this was no exception, as approximately 30 members of the community showed up to show their support. After our presentation and a few questions from council it was confirmed that council is ready and willing to work with us to make this project a reality. On July 17, 2003 the Tofino Community Enrichment Society was incorporated (after months of pen pushing by our fearless leader Cathy). This is the most important step we have taken and the biggest. What this means is that we are now a registered non-profit society which allows us the opportunity to apply for all those grants out there that are going to help us build this park. The forming of the society also gives us the ability to apply for lottery licenses for fundraising events. On August 31, 2003 we ended the summer with the annual Mup-Sup barbecue or Skate-Sup since the proceeds of this years barbecue were going towards the skatepark. This was my first year as a volunteer for this event and I was grateful to be able to work along side all those people in this town that make this a community, thank you all! This years Skate-Sup was more than a success. Thanks to all the generous businesses out there, our silent auction was a big hit this year, thanks to everyone that came out to support us. With the proceeds from the Skate-Sup and the funds we have raised in the past few years we have approximately $30,000.00 to put towards the construction of the new park! We are well on our way to having a world class skatepark here in Tofino! We do have 3-D images of the proposed skatepark so if anyone is interested in seeing them or putting in your input please feel free to contact me. We also have lots of exciting events coming up in the near future so keep your eyes peeled for these and come out and show your support. The Skate 101 clinic was such a success we will be having more of those in the future, the next one is scheduled for October 11, 2003, you can contact April at the district office (725-3229) to sign up. If anyone wants more info give me a call at 725-2072. See you at the park!! Miche Milford has been a part of the Tofino Skatepark Committee for three years and is looking forward to its completion. Reach him for more info or with support and donations at (250) 725-2072. Tofino skate park update: Tofino Skatepark committe will hold a presentation to Tofino council, report from Mup-Sup fundraising.